Cradle of Empires! Become the Chosen One and help the ancient empire rise from the ruins in this adventurous match-3 game with a rich storyline, thrilling quests and captivating characters! Cradle of Empires is an exciting — yet cool, calm and collected — family-friendly adventure. It takes you on a breathtaking odyssey that challenges your matching, building and collecting skills. With the help from Nimiru and Egyptian settlers, you can break the Amrun’s curse and restore the ancient civilization to its former glory. Step up and become the secret weapon in the triumph of good over evil! Unique gameplay mix: You make matches, build a grand city and go on an adventure all in one … How awesome is that? Mega-sized adventure: You’ll be immersed in this engaging adventurous story with unexpected twists, gripping quests and memorable characters. 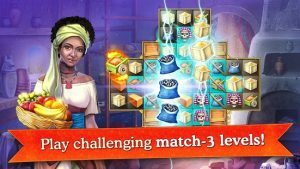 Ancient cities and civilizations: You collect resources by playing match-3 levels, which help you rebuild the cities that evil had destroyed. Different game modes: You play 6 different match-3 modes, a variety you won’t find anywhere else. Many power-ups: You can earn a diversity of bonuses, power-ups and amulets — you’ll develop your own strategy for using them. Regular updates: You’ll never run out of new adventures as you’ll get new buildings, quests, bonuses, levels and whole civilizations in future updates. All this and much, much more for FREE! I’m finding it a great game! I’m playing on Android and have been playing for a month. There is an AWEM web site with lots of explanations, which I needed as I am a 65 yr old with no game playing experience. I have not spent any money (although of course AWEM would like you to) and it is not necessary if you have the patience to wait until your ‘energy levels’ are sufficient again. I’m totally hooked, have got my husband to play too and I can recommend it. Lisca, Thank you for sharing your feedback with us. We appreciate it a lot! It’s really awesome game and fun. But it’s very slow and takes long time to go from one step to another. Also it would be much better if the required scores to achieve three stars be shown at each game. Sarah, thank you for your feedback. We are working on improving the loading time. Please contact us from inside the game. Here is how: Go to the Settings / Tech Support / Write to us. It will help us a lot! Let’s continue the Christmas festivities! Decorate the living room for the holiday in 40 exciting levels. A new event will be available in January! Fulfill Tabia the Jeweler’s request. Make a wonderful adornment and you’ll get an equally wonderful reward. Players with glory level 20 or above will be able to participate. The Sphinx can be upgraded to level 11. New challenges await the bravest players! The Portal of Worlds will send you on a new adventure on January 2.